This new agency introduced the first requirements for the construction of buildings, a site location plan, but with no process for its enforcement. This municipal administration was the only form of local authority until 1971 when, with independence, a ministry structure was introduced, one of which being the Ministry of Municipal Affairs. building laws and regulations for the control of planning and building construction. The consultants continued to work on developing the structure plan but, by 1978 it was evident that the pace of development was outstripping the facility of government to control it. The following year the Ministry established its Town Planning section for the Municipality of Doha, Ll-D having had its contracts moved to the Ministry of Municipal Affairs in 1974 in order to recognise and make more apparent the distinction between planning and construction. Meanwhile, Llewelyn-Davies continued to work on the centre of Doha, their remit changing with time to more detailed work on the identification and design of Action Areas and, particularly the design of Grand Hamad, the road driven north-south through the middle of the centre of Doha. 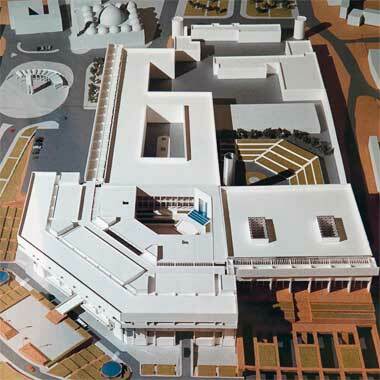 Ll-D were also awarded the design and construction of the major hospital that replaced the old Rumaillah Hospital. By 1978 it was evident that the pace of development was outstripping the facility of government to control it. The following year the Ministry established its Town Planning section for the Municipality of Doha, Ll-D having had its contracts moved to the Ministry of Municipal Affairs in 1974 in order to recognise and make more apparent the distinction between planning and construction. reviewing the existing Ministry staff structure and assisting in training existing and new staff. this latter advice being professional advice on establishing a set of improved building codes for the State, to be enacted and enforced as a continuation of the work of the Ministry of Municipal Affairs. Land control and sub-division also dealt with the increasing problems relating to land adjustment. The initiative to develop land had encouraged many to have their land appropriated and compensated. The situation with regard to boundaries was complicated by the increasing value of land and its reflection in the number of land agents and their operation. During this period, from the late-1970s to the late-1980s, government settled into a period of consolidation, attempting to bring its institutions up to speed while keeping pace with the rate of development. This required increased cooperation between ministries and their staff, but also the continuing use of consultancies. Bear in mind that individuals and agencies were introducing consultants to the country to work on a variety of projects in the public and private sectors, the former including projects for oil and gas, security and the military. It is notable that, during this period, the rapid pace of development slowed as a reflection of revenues from oil and gas which slide during the 1980s. In government, the opportunity was taken to continue to innovate, one particularly useful initiative being the introduction of a Geographical Information System to enable improved accuracy and with it, better information and coordination. This period also saw the Doha Planning Section established its Urban Design and Land Use Standards and Regulations. Generally these followed the recommendations that had been accepted and adopted for development in the New District of Doha. The Municipality established a series of standards that it now sought to implement not only in Doha but by extension, in the rest of the peninsula. Here they are in order to illustrate the thinking at that time. Bear in mind that this work was completed after the introduction of novel requirements in the New District of Doha. Plot sizes are to be 30m x 30m when sub-dividing vacant land, this also being the standard for Senior Staff housing. Plot coverage is to be a maximum of 60%. A Floor Area Ratio – F.A.R. – of 1:2 is permitted. Car parking of 1 space per dwelling unit is a required. A maximum height of 11 metres is permitted within which a basement, ground floor, first floor and penthouse have to be accommodated. Secondary structures – ancillary buildings on the same plot which may be separate from the main housing structure. Secondary structures include servants’ quarters, separate majlis, garaging and storage facilities. Block of flats – a multi-family walk-up or elevator-serviced housing structure. Gross residential density is the total number of dwelling units that may be built within a sub-division, divided by the total area in hectares, including all local, access, and the loop roads, culs-de-sac, pedestrian paths and local community facilities. Very low density – an area with an average gross residential density targeted to 5.25 dwellings per hectare. This density level provides for lots of up to 1,200 sq.m., allowing for the construction of spacious single-family detached housing or either the villa or patio or courtyard house design configuration. Low density – an area with an average gross residential density targeted to 6.75 dwellings per hectare for the construction of single-family housing on moderately sized lots. Possible housing types include detached villas, patio or courtyard houses or row houses. Medium density – an area with an average gross residential density targeted at 10 dwelling units per hectare. Many housing types are possible at this density, including detached single family units on smaller lots, single family cluster housing, townhouses and duplexes. Medium high density – an area with an average gross residential density targeted to 20 dwelling units per hectare. The housing types in this density category include attached units such as townhouses and duplexes, as well as low-rise blocks of flats. High density – an area reserved for the construction of walk-up or elevator-served blocks of flats with an average gross residential density of 30 units per hectare. Sub-division design shall conform to the land use designations, development densities and housing types specified in the Land Use Plan and in the site specific Planning and Urban Design Regulations for the area. In residential areas where a sub-division plan has been established by the government, all roadways and building lot boundaries shall be treated as fixed conditions. Land shall not be sub-divided for development in areas where soil, subsoil or flooding conditions create dangers to health and safety, unless proper provision is made to correct these conditions. The layout of the area shall be compatible with natural and developed features of the area and surrounding regions. The area shall be organised to provide both an efficient layout of infrastructure systems and a pleasant and sociable living environment. Orientation of streets, lots and buildings should be generally parallel or perpendicular to true north in order to minimise the impact of solar exposure on buildings. Orientation along a north-west - south-east axis should be avoided in order to minimise exposure to severe winds from the north-west. Service facilities and higher density housing should be located so as to facilitate access and minimise traffic to them through lower density housing areas. Consideration should be given to grouping lots to create small local areas in which residents may share common facilities. Mixing housing types and lot sizes within the sub-division is encouraged so that the resulting neighbourhood will be more heterogeneous. Leftover or unassigned land areas are to be avoided. All land within the residential area shall be developed or treated. Local commercial – an area for commercial services or convenience retail sals of limited scale such as cafés, restuarants, news stands, tobacconists, drug stores, flower shops or small grocery stores generally provided for the everyday use of residents living in the immediate area. Local mosque – a site designated for a small daily mosque serving the residents of the immediate area. Outdoor majlis – a small pocket park providing a social gathering area for adults residing in the immediate vicinity. Children’s playlot – a small pocket park or ‘tot lot’ allowing young children a safe public play area. Social centre – an area for a social centre of club facilities. Recreation centre – an area for recreational facilities such as a swimming pool, sports courts, playing fields and a club house. Public park – a site designated for a public park or garden for passive recreation. One of the principles established by all the planning consultancies engaged to advise on planning issues was the need to produce a hierarchy of facilities responding to the requirements of the inhabitants of the peninsula. For instance, in terms of roads, these would respond to the traffic loads ranging from the requirements of inter-city arterial highways down to local distributors and roads leading to individual houses. In terms of retail facilities there is a general understanding that there should be a range of shopping experiences from the large regional centres with their collections of brand named goods, supermarkets and associated facilities through district centres down to the small corner shops catering for the day-to-day needs of the residences among which they are situated. This arrangements allows local residents to buy a limited range and number of goods, usually foodstuffs, quickly and on foot without having to travel by car to larger centres where they may have to buy larger quantise than they need. Perversely this policy may be reversed in 2013. These local shops are being blamed for traffic problems in and around residential areas, with the government intent now to bring them under a single roof, in effect, local centres. However, the small shop has a long tradition in the country, many of them expansions of garages where the owner has the advantage not only of making profit from a small-scale retail facility, but of the staff employed there also to carry out other duties for him. But they also offer immediacy, safety and a continuation of a socio-cultural tradition. It appears that for traffic to have become this much of a problem, there must have been an unplanned expansion of these small shops, as well as a poorly planned relationship with housing. Regional, primary, secondary and local roads are normally situated outside or on the perimeter of any residential area. all habitable buildings shall be provided direct vehicular access. The circulation system should follow the established road system hierarchy with traffic descending from primary or secondary roads to local roads, thence to access roads, loop roads and culs-de-sac, and finally to individual lots. Streets should be sized according to intended traffic load with culs-de-sac carrhing the least traffic and loop roads, access roads and local roads carrying increased traffic loads respectively. Local roads shold provide the link to high volume primary or secondary roads. Internal streets should be designed to discourage through traffic. This can be accomplished by use of loop streets, culs-de-sac and T-intersections. Four-way intersections are not allowed. Where appropriate, internal streets in a residential area should connect with streets in adjacent areas. If connected, the road reservation of both streets should be equal. Where street systems of adjoining residential areas have not been constructed, it is the responsibility of the developer to identify the location and status of adjoining streets to ensure maximum coordination. In general, streets should intersect as nearly as possible at right angles both for reasons of safety and to avoid difficult lot design problems. Intersections of more than four streets are not allowed. Internal street systems shall be designed to accommodate not only vehicular circulation but also pedestrian circulation and utility systems. Roadway reservations shall include space for sidewalks and utility lines as determined by the relevant government authority. Grades on internal streets shall be not greater than 8% nor less than 0.5%. Tangents between reverse curves of an ‘S’ curve on local or access roads shall be a minimum of 50 and 25 metres respectively. The minimum radius of all internal roadway curves is 50 metres. Corners at intersections must be rounded to permit safe turns. Visibility as intersections must be provided by means of a clear zone within which no wall or object taller than 0.4 metres is permitted. Streets shall be designed according to the topography of the area to minimise grading and facilitate surface drainage. Stop signs shall be provided at the intersections of local roads and access roads. Parking in residential areas is to be located principally on building sites or in off-street parking areas. Street parking is discouraged. When street parking is permitted by the Site Specific Regulations, it is to be designed as lay-bys differentiated from the traffic roadway by construction materials and lane striping. Lay-bys or street parking are not permitted within the clear zones required at intersections. Off-street visitors’ parking shall be provided within convenient walking distance of the units to be served in parking bays off the traffic lanes of residential streets. Villas – 1 per dwelling plus 1 per additional 200 sq.metres. Flats – 1 per dwelling up to 16 flats plus 1 per additional 4 flats. Commercial – 1 space for each 25 square metres of net usable floor area. Educational – 1 space per classroom plus 10 spaces. Religious – 1 space for each 10 square metres of total prayer area. Recreational – per programme requirements. Wherever possible, access for delivery traffic should be separated from other traffic and designed not to interfere with pedistrian traffic. All outside storage and dock space shall be visually screened from parking areas and pedestrian systems by a landscaped wall at least 2 metres in height. Provision shall be made for access and parking of bicycles, motorbikes and motorcycles in appropriate, distinct locations. The Ministry of Municipal Affairs and Agriculture has been responsible for the physical planning within Qatar. Its Urban Planning Department controls this through the medium of its plans, this to the side being the Greater Doha Structure Plan which is stated as intending to establish and control development through to 2030. The plan incorporates six inter-related components – current and proposed physical development patterns, land use, community facilities, transportation, utilities and the environment – all within an interactive framework. This illustration indicates the planning of land uses around the West Bay about 2003. Taken from a document prepared for the second ministries competition in 2003, and illustrating the intentions of the Ministry of Municipal Affairs and Agriculture’s Urban Planning Department, you will notice a significant change along the Corniche where the area recommended for the ministries in the WLPA 1979 plan has been changed to landscaping. The business district and public plaza elements of the NDOD remain the same. 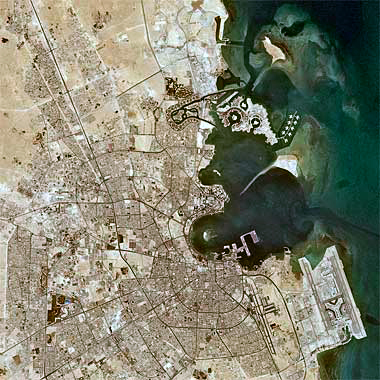 In urban design terms the change signifies a reinforcing of the visual separation of the two urban centres – the NDOD and the old centre of Doha. The impetus given to the development of Qatar by Sheikh Hamad saw the introduction of Louis Berger and Hellmuth Obata and Kassabaum to the planning process in Qatar in 1997. 1994-1996. ??? One of the important initiatives intended to encourage development within the new plan for Doha was a competition for the design of a ministries complex for Doha. The competition was initiated in 1976. This particular element of the Corniche was seen to be an important physical link, joining the business district of the NDOD with the Diwan al Amiri and existing centre of Doha, an area with no development on it other than the Ministry of the Interior on feriq al Bida and the National Theatre at Rumaillah. It was intended that this result of the competition would run along the Corniche, focussing on the West Bay, and establish a high standard of design. More than this, the project was understood to be an extremely important initiative as it would hopefully resolve a number of issues that were becoming increasingly apparent with the administrative, organisational and physical development of the State in its different aspects, as well as promoting the image of Qatar both within and outside the country. Firstly, the project was intended to fulfil, or at least seed, the growing need for government offices that were not required to be either security discrete or location-specific. Secondly, it would be one of the projects intended to establish high standards of design and construction, the others being the Hotel and Conference Centre, the University and housing for Government Senior Staff employees. Thirdly, the development would join the existing group of government offices immediately north of the centre of Doha with the State Plaza, the other side of which would be more business related and occupied by quasi-governmental organisations and private business. Fourthly, and in urban design terms, it would create an organised façade to the Corniche which was conceived as having a recreational and ceremonial status in the road hierarchy, thus creating a recognisable face for the emerging capital of the peninsula. A fifth architect of similar status was invited to participate in the competition, visited the country, was briefed and taken round the site by helicopter, but declined. The four illustrations above are taken from the schemes submitted by the four architects and are interesting in many ways, unusually illustrating quite different approaches to their urban design solutions – though all responded accurately to the design brief. The lowest of the four illustrations above, this plan and the detail photograph, are all of part of the model of the winning Kenzo Tange and Urtec scheme. In it the prestigious offices and elements of the ministries form a continuous band at the front of the scheme parallel with and looking out north over formal landscaping and the Corniche into the West Bay, with the standardised working offices behind them, capable of expansion, and taking their day-to-day access from the service road developed parallel with the Corniche. Vertical circulation for the offices was to be organised within circular corner towers which gave a particular character to the project, and the long axes of the offices themselves radiated around the West Bay rather than being designed on north-south or east-west axes, as was the normal practice. Regrettably the winning project never got off the ground due to a number of difficulties, particularly in deciding practicalities and coordination with regard to the different ministries originally selected to move to the site. But there were additional difficulties. 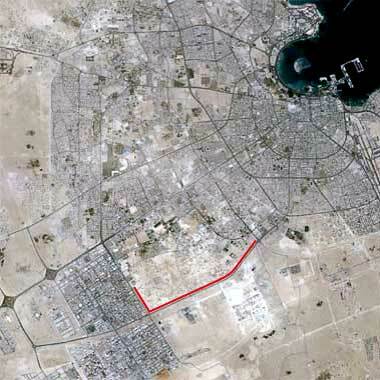 There had been considerable problems in obtaining the spatial schedules and functional requirements from those ministries selected to move, many of whom continued to wish to build in locations that were in conflict with those of the notional plan to set them along the Corniche or within the New District of Doha, and who found continual reasons to revise quantities or amend their other requirements. There were additional difficulties relating to identity for the ministries, nearly all of them wishing to have their image distinguished from others. In retrospect none of the problems experienced was unusual and might have been better understood and managed at the time. Nevertheless, the Tange scheme was progressed and developed, taking into consideration the changing parameters as and when they could be agreed and confirmed. The two illustrations above show an intermediate and final view of the Tange scheme, radically different from the original concept but, ultimately, not built. It is interesting to speculate how this might have affected subsequent development had that initial scheme been constructed. The Diwan al-Amiri is the two-storey building from which the country was officially governed by Sheikh Khalifa from 1972, though previously he had worked from offices in Government House. This aerial view of it, taken from the north-north-east, was made in March 1976, and shows it occupied with the cars of staff parked in front of it and with works in hand on the landscaping between it and the Corniche. The Clock Tower is just out of picture, top left. The reason for its inclusion on the page dealing with planning is that it was seen to be an important urban element in the planning of new development in Doha, and should be understood in its relationship to the ministries project above. In the early nineteen-seventies the Diwan al-Amiri occupied a prominent position west of the centre of Doha, as illustrated in the photograph above taken in 1976. The development consisted of offices at first floor level wrapped around two courtyards – four sides of the northern courtyard and two of the southern. North-west of the northern courtyard was the structure which had been built to house Sheikh Ahmed, but never finished or occupied. On the ground floor were mainly State function rooms, particularly a majlis and dining room. Although the Diwan appeared to be, and is, a large building, there were relatively few people housed in it. So, with the need to house increasing numbers of people in the Diwan al-Amiri, plans were initiated to find a useful way of enlarging the building. This was also seen as an opportunity to establish a strong urban design element at the south end of the West Bay, in effect a focus for the intended development that was to stretch around the bay. It would link the existing government buildings to its east with the ministries project which was to extend west to the State Plaza and would also be a focus for these existing and new developments. By the late 1970s, the Diwan al-Amiri was becoming crowded with the staff needed to respond to the growing requirements of that office. From the outside the building appears to be large with the suggestion it could house many. But it is essentially a series of rooms served from a wide corridor wrapped around two courtyards on two levels. Combining solutions to both the needs for office space, a more international setting for the important State functions carried out within it, and an urban design element for the developing Corniche, the first initiative for expansion suggested that a building might be created in the angle between the Diwan al-Amiri, the unoccupied extension to its north-west, the Corniche to its north and the access road from the Corniche to the Clock Tower roundabout. A design brief was produced with a relatively modest schedule of requirements that were to be contained in the new and refurbished buildings. These first two sketch models illustrate something of the thinking behind the project and its external appearance. In the above two photographs of the project model, illustrating how the scheme might appear from approximately the north-east, the location of the new building can be clearly seen together with the new façades intended to tie the new building visually to the older structures. Note also the intent to create a large plaza immediately to the east of the Diwan incorporating the Clock Tower, and to relocate the access road further east to accommodate this. Designed by the Japanese architect, Professor Kenzo Tange, the schematic design shown above was developed into a full design within the constraints of the site, this first photograph illustrating the finished presentation design from a northern, aerial perspective. The Clock Tower and Grand Mosque can be seen in the top left of the photograph with the Corniche out of picture at the bottom of the photograph. 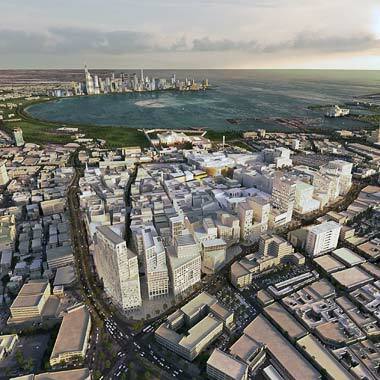 While it was envisaged that the scheme could be expanded both to the south and west, there arose a concern for the proximity of the main offices to the Corniche. It was then considered that for both security and urban design purposes, the building should be set further back from the Corniche in order not to act as a visual stop to the run of prestigious buildings that were envisaged running from the Sheraton Hotel at the end of the West Bay through to at least Government House, east of the Diwan al-Amiri. In this aerial view of the model viewed directly from the east it is possible to compare the differences between the sketch design and finished design models. A major urban design change will be noted: the concept of creating a large urban square immediately to the east of the existing Diwan al-Amiri by the introduction of a strong architectural device, a colonnade, was dropped in favour of keeping the existing road pattern and allowing the staff parking to remain at grade in that area. Although significant consideration was given to the issues relating to the main entrance to the extension, particularly security, it is evident that the solution shown would neither benefit ceremonial aspects of the development nor be particularly secure. In retrospect it can be thought that this decision did not permit the breathing space in front of the Diwan al-Amiri which it deserved when looked at from an urban design point of view; and it was considered that, while creating a beneficial public space connecting the Diwan with the Grand Mosque to its south-east, the colonnade would have obscured the newly installed eastern façade of the building. The third of these five images shows the main entrance façade of the building, looking directly from the north-east. The long, unbroken line of the roof may seem unusual in the context of the traditional architecture of the peninsula, but it replicated that of the relatively modern existing buildings. The last two of these five photographs of the model illustrate something of the character sought for the new entrance area. The modelled, naqsh decorated, pre-cast concrete finishes intended for the area would be complemented by banked areas of planting alternated with water features intended to bring colour, movement and coolness to the enclosed space. The images look approximately south and south-west from within the extension across the contained entrance courtyard. Although they are too small to discern at this scale, the ogee headed windows of the original building can be viewed through the rectangular openings in the new extension. For a number of reasons the initial project did not go ahead and it was decided that the site for the new building should be moved further west onto the site of the old, unoccupied extension. The concept for this new site was initiated within the Technical Office of the Diwan al-Amiri with that schematic forming a revised brief then developed into an architectural scheme by the architectural company, Rader Mileto and Batori. The first photograph above, an aerial view from the north-west of one of the models, shows the project at a fairly advanced stage when the organisation and massing had been agreed upon and the project was about to go into design development. The lower photograph is of one of the many exploratory studies made to examine elements of the building, in this case the external cladding where the intent was to develop a façade which had a traditional architectural character, responded to the prevailing environmental conditions, and was suited to high quality pre-cast concrete construction methods. Viewed here from the Corniche to its north-west, and under construction in October 1983, the new Diwan al-Amiri – sometimes referred to as the Doha Palace – was contracted out as a number of design-build packages in order to obtain both the character and quality of work envisaged by the client. Each of the packages were based on client initiated design briefs which were seen to be a necessary method of directing the design of a building whose external presence would represent the face of Qatar both to those living in the country as well as to foreign dignitaries visiting the country. Its interior, in particular, would need to reflect this. Both the manner in which it presented itself through its urban positioning, as well as the detailing of its interior at the different scales to which it was to be experienced, were seen to be crucial in creating this integrated development. The various design-build packages were issued to a small number of carefully pre-qualified contractors, this method allowing the design intent of the client to be coordinated and assured while complying with the government’s legal requirements established and monitored by the government’s Central Tenders Committee. The central of the three photographs above shows an element of the pre-cast concrete external cladding being manoeuvred into position in December 1983, while the lower photograph is a detail of a glass sample reflecting the relatively simple design intent derived from the detailing of traditional architecture of the peninsula. Work continued on the Diwan al-Amiri for a number of years using, as mentioned above, design-build packages in order to enable each to focus on the specific design element of the project. Although the construction elements of the project were carried out rapidly, the finishing to the high standards required took some time with the external works and some of the small scale packages being the last to be completed. Occupation was not fully effected until the beginning of the 1990s. This photograph, taken from its north-east, shows the Diwan al-Amiri over the Ministry of Foreign Affairs and the trees of the Corniche in January 2002. More will be written on this project elsewhere. The Diwan al-Amiri was completed and occupied some time ago, and is seen here in this aerial photograph taken in 2011. The photograph illustrates the relationship of the Diwan al-Amiri complex with the Corniche crossing the picture top right – the Ruler’s jetty being just out of picture. The Clock Tower roundabout is in the bottom right of the photograph with the old Diwan al-Amiri building between the Clock Tower and the new Diwan al-Amiri building. It appears that the old building is having work carried out on it and that the parking area north-east of its entrance has disappeared. The photograph shows the Diwan in its relationship with the Corniche, the distancing giving it both a degree of security as well as a comfortable space to view it in urban design terms. The photograph also illustrates clearly the disposition of the three wings of the building; the two office wings on the east and west of the central atrium, the third wing on the north side taking advantage of the views directly over the West Bay. In order to begin the process of creating and improving a wide variety of activities in the Qatar peninsula, the New District of Doha was identified as a setting for a number of different types of activities that might be suitable for this area, given its relationship both with Doha as well as with the north of the country. It was seen as being particularly well suited to the development of recreational activities. A number of studies were carried out, one of them being by Kenzo Tange and Urtec. This produced four alternative schemes for a resort development to be situated on jazeerat al-’Aliya, the island located immediately to the north of jazeerat al-Safliya. Al-’Aliya was determined as being the setting for this particular study within the NDOD, in preference to the nearer island of al-Safliya, in order to draw recreational activities further away from Doha and avoid concentrating such facilities within, or even close to, Doha. Bear in mind that at this point in time, 1977, al-’Aliyah was considered to be a significant distance from intended development in the NDOD as was, for instance, the university. Although the improvement of recreational resources was deemed to be a priority, for a number of reasons this particular project was put on hold and never realised. The lower illustration of the two above is of one of the four Tange and Urtec schemes that were developed for the island. As was mentioned in the note above on the Corniche, one of the design elements intended as an integral part both of the Corniche as well as Grand Hamad, was a strong vertical element. This would form the northern focus of Grand Hamad as well as identify the location of the Doha’s suq from the Corniche, in a sense balancing the Hotel and Conference Centre that marks the end of the New District of Doha, approximately 2.8 kilometres directly across the West Bay from the tower. One of the factors for deciding its location was the positioning of the three small reefs, illustrated above, north of the jetty which, it had transpired, would be difficult to remove inexpensively but which might form a suitable base for a tall structure such as a tower. This sketch plan illustrates the organisation of the jetty on which the tower would be located with parking at its base together with a small number of spaces reserved for marine craft that would move people around the bay. As can be seen from this photograph of the model set between elevational and perspective sketches, the tower itself was envisioned as a pair of hyperbolic parabaloid structures, both standing on end with the accommodation and vertical access elements of viewing platforms and restaurants set between them. For a number of reasons, this project also did not proceed though the perceived need for a visual focus within the bay continued to arise, another solution considered being a tall water jet, similar to that in Lake Geneva which projects water to a height of 140 metres. Today there is an island in the middle of West Bay that provides a similar focus. In many ways one of the most important projects that was initiated for the New District of Doha was the provision of housing for government Senior Staff.Its importance was that it encouraged the design of a better standard of house, improved standards of construction were achieved, it brought a cadre of young Qatari professionals into the process of design and construction, and it required closer cooperation between government departments than had previously been the practice. One of the first, and larger, houses is shown here. This aerial photograph is of a part of one of the earlier areas of Senior Staff housing within the NDOD. This was a novel type of design for Qatar, both in its planning and design. The photograph gives an indication of the character of the layout with its primary and secondary traffic circulation or distribution system leading to cul-de-sac groupings, a character of development dealt with elsewhere in more detail. It is interesting to observe the amount of development on the lots, but the most important contribution made by the housing was the improvements it brought to housing generally throughout the country by raising development standards. To illustrate a little more of the character of the New District of Doha as it has developed, this photograph, taken late 2009 and looking more or less north-west from one of the taller buildings in the commercial district lining the Corniche, shows the predominance of two-storey housing. It also illustrates the lack of structures that aid way-finding, something that the sculptures on roundabouts may help with. What are also not visible are local retail centres as they are few and far between in this part of Doha, but there are a number of masaajid constructed to serve the population of the NDOD. One is just visible in the bottom right corner of the photograph. All this development has benefited from the standards introduced with the Senior Staff housing project. With the rapid and unrestrained development of the country, a number of bad and poor practices had developed, demonstrating themselves in both design and construction. There were, of course, concomitant problems with both the construction industry as well as the government and its ability to police and control these burgeoning activities, but it was realised that the Senior Staff Housing Project could both provide exemplary housing for those who would live there, while assisting the government in improving a number of issues apparent in the building industry as a whole. Many of the designs that had developed as standard in the country were imported from countries where those designs may have made sense but, in Qatar, did not. Obviously imported styles had little or no relevance to Qatar if they came from the northern Arab states, Indian sub-continent or Europe and the Americas. Moreover, such styles debased, supplanted or prevented the development of a national style in Qatar. Because of this it was decided to establish a system for designing and approving those designs with the intention of ensuring that those who lived in the houses would not disbenefit from poor design decisions. A competition among architects was held in the first instance and assistance given to designers to understand the problems of designing in the region, and suggesting improvements. Much of this supervisory work was carried out by a cadre of young Qatari architects and engineers, employed by the Office of H.H. The Amir, who not only brought improved standards of design and process to the project but, in obtaining professional experience, formed a body of nationals with practical experience. This enabled government to move them on to other projects in time, disseminating the skills they had learned and widening the knowledge base of nationals, hopefully reducing reliance on expatriate skills. One of the first benefits to be experienced was improved cooperation between government departments. With the development of the ministries noted above and relating to construction, chiefly the Ministries of Public Works, Electricity and Water, and Transport and Communications, there was a tendency for their departments to plan and resolve their individual problems without reference to other activities that were, or were likely to be carried out in the same area. The most visible evidence of this was the installation of services in newly laid roads, an issue that caused increasing irritation both within and outside government. Much of these problems were the source of continual complaints and related to much of the existing area of Doha and the main conurbations. It was intended that the New District of Doha would be better. To this end, a committee was established in the New District of Doha, meeting weekly, chaired on-site by the Office of H.H. The Amir, with the purpose of coordinating all utilities. In this it was relatively successful, the main difficulty in preventing trenching in new roads was the steadily increasing electricity loads required of upwardly mobile residences. An example of one of the larger initial houses is shown here, under construction. As a result of the success of the committee, the concept of coordination was then imposed on the rest of the peninsula, albeit with varying degrees of success. Another area of improvement was that which dealt with the contracting industry working in the New District of Doha. A proper system of pre-qualification was introduced to all contractors hoping to work in the area, a system that looked at the overall experience and capabilities of the contractor and particularly their supervisory staff. Equipment is not necessarily a problem in the peninsula, though its maintenance may be, but it is staffing and their capabilities that can be problematic. The pre-qualification encouraged companies to structure and staff themselves properly, and to put in place any requirements that were deemed missing. At the same time, the quality of materials and their testing and incorporation were examined in order that those used on the various buildings should be of good quality, suited to their purpose and installed appropriately. Samples were demanded, testing required and written statements produced relating to work methods. In addition to all this, books were produced for every house incorporating their plans, utility systems and maintenance schedules together with planting palettes and recommendations for good practice, essentially a maintenance manual for each house on its site. The evolution of the Senior Staff housing was beneficial to the State in many ways, not just to those living in the housing. It was a significant advance in the development of the construction industry, government structures, standards and personnel. As such these improvements were passed into the general benefit of the national community. These next five photographs were taken around the mid-1980s. This first example of one of the approved Senior Staff houses gives an indication of the volume of house on its lot. This can be compared with the larger house shown above. The photograph shows, at the front of the property, pre-cast concrete posts waiting for the installation of the pre-cast concrete boundary wall panels that were added for security and privacy. On the left is the standard pre-cast concrete utility panel provided to all houses. The house above, and these two examples, illustrate the manner in which the houses were designed to be located centrally within their lots. This was the general rule developed from experience with Public Housing where no new owner wished to have their house developed along a shared or party wall – this despite considerable efforts being made to point out the advantages to those living on the site. The most frequently stressed counter-argument to joining developments to party walls had to do with security with clients claiming that people would jump over their walls. These arguments were never substantiated with such experiences and were likely to have been created by other issues. It was disappointing in that more usable, secure and private external areas can be created by boundary development, and better relationships between the inside and external areas of a plot created. Having said that, some owners managed to take advantage in their designs by linking to the boundary or party walls, nearly always with ancillary buildings such as garaging and servicing accommodation. This was permitted within the planning rules for the area, but had to be closely monitored in order to maintain a degree of parity with all owners, some of whom attempted to push the boundaries, almost as a matter of principle. This example shows how one architect managed to keep the bulk of his building in the centre of the lot while stretching it to the boundary. This house is a good example of organising external windows to reduce overlooking as well as guarding privacy. In a slightly different manner, this architect was able to move a two-storey element of his building to the front boundary. I have no recollection of how this was managed as it would have theoretically conflicted with planning requirements, but in principle there should have been no objection as the house fronted two different roads. A more serious problem was that some of the houses, not following planning requirements, developed right up to neighbouring boundaries. It is probable that there would have been a degree of cooperation with neighbours in these cases as Islamic law provides for issues such as these on a case-by-case basis. Planning blight has been mentioned elsewhere. Commonly it is seen in the context of the loss experienced by owners whose properties are down-valued as a result of adjacent properties being poorly maintained, or demolished. This in turn may be due to planning requirements changing or being delayed, or in the market being unable to sustain development of the appropriate character. While I have suggested that the meaning of blight differs in Qatar, there is a significant amount of demolition around the major centres, particularly within the centre of Doha, as ground is prepared for further redevelopment, usually at a higher density or over a greater area. Those who live in Qatar have become used to this, though the process brings about not only problems associated with dust, nuisance and increased traffic but, often not fully recognised, difficulties associated with disorientation and loss. The photograph above illustrates something of the character of urban space those who live in Qatar witness on a daily basis as older developments are taken down prior to their being redeveloped. The issues relating to loss seem to be felt by the older generations of Qataris who have their memories of the past while the younger generations take the work more casually. It is difficult to understand how this is really experienced by the national population, but this may be looked at on one of the pages dealing with Qatari society. Disorientation seems to be more related to the expatriate population. Qataris have a very good understanding of their geophysical location at all times. It is seen partly as a natural feature of those who had to make their way both on land and sea, as well as the need to understand the direction of prayer. Westerners, particularly, seem to need landmarks for way-finding and their absence or movement can be unsettling. This photograph is of an old palace on the Rayyan Road with an area of land cleared in front of it for development. In the distance, two of the tall buildings on the New District of Doha can be seen. The photograph illustrates something of the change that is happening at all levels of society. This property is situated in a highly valuable position but, like many of the sites that are being cleared within the inner area of Doha, it is an important landmark in the urban scene as well as in the collective memories of those living in Qatar. This in turn has its effect on the way in which planning affects our individual and collective histories. Conversations with Qataris suggest the latter deal with the issue in a number of ways, to some extent reinforcing their personal links while also increasing for some their concern for the effects of change on their society. It is my intention to write about this on one of the society pages, but it is mentioned here as it appears to me to be an area of planning that needs to be borne in mind, though is rarely considered. In the meantime, development all over the peninsula, and particularly in Doha, continues apace. It is not possible to build everywhere coevally, which leaves many relatively recent developments behind in this race to build and rebuild. In this first photograph new developments sit beside and behind a building in the centre of Doha. Buildings such as this are commonly used for storage or accommodation for expatriate workers, probably introduced by the building owner. These buildings contribute to the visual blight of the area, and there is little that can be done to improve the street while they exist. But they are now so common as to go unnoticed by nationals who may not even visit these streets, and to be unnoticed by expatriates who are likely to have only a passing interest in the urban scene, and have no commitment to the look of the urban environment due to their having no legal or emotional attachment to the country in which they are residing temporarily. Yet, in some parts of the centre of Doha there still exist properties, some as single storied developments such as this, catering for the expatriate communities. These and even the decaying building above, nevertheless contribute to the look of the city and to the overall experience of living there. In a sense it can be argued that these buildings and their attendant activities, sounds and smells help to give personality to the city, and bring benefit to those unable to use the more upmarket developments springing up all over it. So, while these properties are blighted, they also cater for many. Incidentally, the shop in the centre has its name, ‘Modern Shop’ transliterated into Arabic rather than it being a translation of the Arabic. That, and the addition of ‘As Seen On TV’, add to the charm of the façade and help to make a positive contribution to the character of the street – though this would be a romantic Western view, rather than a view of nationals. The important point to bear in mind is that development on the scale in which Qatar is changing relies on expatriate skills and labour, the expatriates requiring accommodation and servicing, and much of it being in buildings such as those above – inexpensive properties which, generally, means old buildings in a poor state of repair and a continuing feature of the urban environment. This aerial photograph of Doha and its immediate environs was taken by NASA on the 5th October 2010. It illustrates the continued growth of metropolitan Doha. Not only is the development of the urban fabric shown increasing to the west and along the road leading to the north of the peninsula, the extent of amendments to the shore line is evident with new development sandwiched between the islands of al-safliya and al-a’aliya. Note particularly the size of the artificial islands compared with the size of the West Bay, and the shallow waters to the east of al-safliya and the dredged channel to Doha’s port. The new airport development, constructed on reclaimed land to the east of the old airport, is also a notable feature of the extended metropolitan area. As a reminder of progress, three years later this early morning aerial photograph looks over the New District of Doha illustrating not only something of the character of the new buildings lining the Corniche, but also of the extent to which the area north of Doha has been developed. The Hotel and Conference Centre can be seen bottom left with the Diplomatic Area still unfilled bottom right, but lower density development, mostly residential, can be seen to stretch away from the coast west into the desert as well as moving north towards Umm Salal Muhammad and beyond. It is interesting to compare this photograph with that of a model of the original planning intent. Meanwhile, the government continues to deal with the problems it sees as constraining or affecting development and, in January 2010, announced a crucial stage in its preparation of the Qatar National Master Plan 2032. Looking twenty-two years ahead may seem a long time bearing in mind the different things that may come about in the interim and that might influence policies and goals. But establishing long term goals and objectives creates a framework in which shorter term strategies may be set and met. The presentation suggested that it might take until the end of the year to obtain cooperation with a variety of stakeholders in order to complete the draft which would then go to ‘higher authorities’ for ratification. conceives developing special zones solely for Qataris, both existing suburban areas as well as those within the city. attempts to reorganise traffic models to reduce existing congestion. All these policies will have a considerable effect on the national population, particularly those having interests in business and development as there is considerable value in land, real estate and the construction industry. The planners have stated that there are discussions being held with private and public groups with an interest in planning. At same time, of course, the plan will be discussed and debated throughout the majlis system which means that all will be aware of it and will begin the process of making representations formally and, particularly, informally in order to take benefit. As I have written in a brief note elsewhere, the Gulf states have developed many of the institutions and organisations of the West, yet the majlis system still operates. This informs the processes and, in many instances, drives them. Of particular interest is the introduction of overt policies to create areas in which only nationals would live. This is not new, of course, it was practised years ago with the development of the Salata al-jadida area for members of the al-Sulaiti qabila who were moved from their feriq on the east bay of Doha. The Government Senior Staff area in the New District of Doha is also an area reserved for Qatari nationals. While nationals may have houses in reserved areas, there is at present nothing to stop them leasing their houses to expatriates, a common and useful source of revenue. In addition to this, many expatriate service personnel live within their boundary walls as well as within conversions or additions given over to small shops, again a useful source of revenue as well as providing a necessary retail resource to those living in the neighbourhood. While the areas selected are associated with roads, they illustrate a reaction to pressures within the national community to increase the profitability of their land by enabling other uses to be established. One of the issues that developed in the 1970s was that associated with mixed use development. Traditionally Qataris lived with or adjacent to their businesses which, on the whole, were associated with retail activities. Increasing wealth in the country saw the development of villas and apartment blocks and, responding to the increasing requirement for office space, villas and apartments were rented within residential areas with those structures given over partially or wholly to the new businesses. As has happened elsewhere in the world, this trend saw the later development of office blocks being established, but with the concomitant difficulty that the new owners preferred to rent out the whole building or at least a floor at a time. This rationale may well have something to do with the current freeing of planning restrictions to test the market for relatively small units and see if more mixed-use development will be commercially sustainable while not impacting those living in the residential elements of the areas. At the same time, use segregation is tied to a number of other issues, particularly those relating to affordable accommodation for ex-patriates where the practice of splitting accommodation, legally or illegally, has created difficulties for the authorities and the social and political pressures under which they operate. For instance, this saw, in 2015, discussion suggesting taller buildings should be constructed – although this was countered by the Ministry of Municipal and Urban Planning who argued, sensibly, that the utility and servicing infrastructure had not been planned to provide for a greater density. In a sense, this might also be argued as a problem facing the New District of Doha. Generally, Qataris wish to live in residential areas where they will feel safe, but where facilities are located nearby for their daily use, and where they have access to a road infrastructure that will take them rapidly to those areas and destinations that either interest them and their families or where there is an absolute need to travel, such as work and schools. Shortly after this change of plan was unveiled, (Arabic) a further loosening of planning controls was announced by the Ministry of Municipality and Environment. In the first instance this allows recently constructed garages and scrap shops in a part of the Industrial Area to be used for residential accommodation, as well as for offices and storage. At the same time, height restrictions are being relaxed with two storeys and basement being permitted where, previously, the regulations set a limit of ground floor and mezzanine. Ostensibly the relaxations are a response to citizens wishing to have more flexibility in the use of their lands, a similar rationale to that written about above. A number of commentators have suggested that this is a poor decision, though it is a continuation of trends that have witnessed the Industrial Area having seen a significant increase in use responding to the construction boom. Perhaps conflicting with this development, the State believes that the construction activities will reduce in 2017, so witnessing a reduction in the population and a lessening need for accommodation. The creation of residential accommodation in areas established for industrial use is not in itself wrong, but there will be significant problems for those living there if the residential accommodation is not designed to good standards, particularly with its the relationships with industrial activities and of the provision of ancillary facilities. Bear in mind that there are continuing and significant complaints relating to the standards of provision for housing the workforce. Mixed uses are a normal characteristic of planned development. The difficulty Qatar faces is with locating development in the optimal areas of the country, particularly bearing in mind the aim to move from a low-skilled, low-productivity and low-wage economy to a high-skilled, high-productivity and high-wage economy, as is set out on p. 161 of the Qatar National Development Strategy 2009-2016. The centre of old Doha has, over time, been downgraded in its importance by the development of business districts in the New District of Doha, Grand Hamad and a number of other areas dispersed in and around Greater Doha, as well as within the peninsula on established urban settlements and new areas based on industrialisation. This has been a part of the natural process of urban, State and commercial development. But one of the consequences has been a materially degraded central suq in Doha. To some extent traditional commerce was reinforced by the demolition and complete redevelopment of the old suq into the tourist attraction known as suq waqf. This development saw the removal of the central maqbara, the rehabilitation of the Turkish fort and the complete rebuilding of the suq in its original one and two storey forms. Many of the original tradesmen continue to operate from there, but together with more retail outlets suited to its new role as an attraction not just for tourists but also those living in the peninsula, both expatriates and nationals. It is an engaging experiment which appears to be successful. Together with suq waqf, the centre of old Doha has been the focus of commercial and business activities since the beginnings of its development over sixty years ago. Adjacent to suq waqf the area is known as Muhammad bin Jassim, though more popularly as Musheireb and is bounded on the north by the Rayyan Road, the west by shara’ al-Diwan, on the south by shara’ ali bin Abdullah and, on the east, by the newly redeveloped suq waqf. It contains the once popular commercial streets of shara’al kahraba, shara’ abdullah bin Thani and shara’ al-Asmakh as well as shara’ musheireb and shara’suq waqf. Around 2005 initiatives were begun with a view to demolishing the whole of this area and building in its place a relatively dense mixed use replacement to be known originally as Dohaland’s‘Heart of Doha’ project, but now the ‘Musheireb’ project. The notional illustration at the head of this note looks over it from approximately the south and illustrates its relationship with the Ruler’s Offices seen in the centre adjacent to the West Bay and the two storey development of suq waqf on the right. The Islamic Arts Centre designed by I.M. Pei can be identified top right projecting into the bay. The project is ambitious in both its scope and intent. Covering around 31 hectares, having had a budget established at around $5.5 billion and destined for completion in 2016, the design is to be established on the five principles of enrichment, environment, heritage, innovation and sustainability and, from a design perspective, there will be an intent to incorporate certain aspects of traditional Qatari architecture such as proportion, simplicity, space, light, layering, ornament and response to climate in the buildings and their environment. Dohaland will build environments that support and encourage sustainable, innovative communities, enrich individual lives, promote environmentally friendly living and rediscover the heritage and culture that makes a place unique. However, the most important parameter is to reverse the planning of the past generation by encouraging a more integrated development that reduces the impact of cars and introduces a tighter, urban environment more suited to the region. the first phase infrastructure includes central cooling plant, utilities and waste provision, basement service roads and parking. In the second stage, which will is expected to begin this year and conclude in 2013 a multimedia centre for arts, central hotel and serviced apartments, luxury shopping street, exclusive town house, a primary school, the Ferjan Square mosque and see the first stage of rebirth of Al Kahraba street. The later stages will include a connection to souq wakif, a retail mall, more hotels, offices apartment, shops, a tram system and an underground Metro station hub apart from to Nakeel Square. All in all, an extremely ambitious project bearing in mind the state of the market at the beginning of 2010 and the general pressures bearing on development in the peninsula and region. in constructions ranging from three to thirty storeys in height, and with the intention of the overall development achieving a LEED Gold rating. There are four architectural practices working on the Musheireb development – Adjaye Associates, Allies & Morrison, John McAslan & Partners and Mossessian & Partners. The award-winning project for which Mossessian and Partners are responsible is known as al-Barahat Square and forms the focus of the Musheireb development. The scheme consists of 65,000 m² of civic space comprising nine mixed-use, residential, commercial and retail buildings arranged to create a major public square at the heart of the Mushaireb scheme. 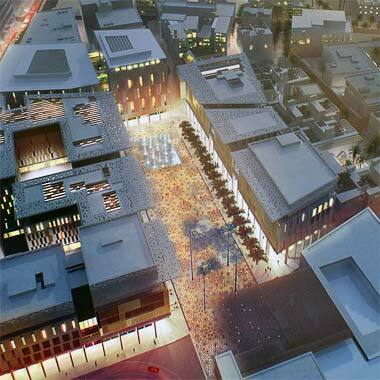 This aerial illustration is intended to present a view of al-Barahat Square at night, and suggests that it is designed at a significantly lower density than the illustration at the top of the note which was an indication of the original concept for the development. While it is not always easy to judge schematic illustrations, they do represent the designers’ urban design and architectural intent in visual terms. It is de rigeurnow for all modern designs in Qatar to claim they reflect strategies that will offer sustainability, efficiencies and comfort to users and, often, links with the traditional architecture of the region if not the peninsula. The al-Barahat Square development is no different, nor should it be, of course. The elements of sustainable architecture claimed for this project are those relating to sun, wind and mass together with references to the development of a new vernacular based on traditional Qatari vernacular. These three illustrations are of the al-Barahat Square looking in different directions along its long axis – the first and second looking one way, the third sketch looking the other way from the head of the square. They demonstrate a number of the devices that the project will use in order to reduce the impact of, particularly, the sun on both the buildings as well as those who move in and around this area of Doha. The long sides of the square benefit from two protective design devices, arcades and horizontal shading at a high level. The arcades should protect most of the façades at ground floor level, and the horizontal high level devices will give a degree of shading to the façades above ground level which, themselves, appear to have been designed as screens or brise soleil, both sensible architectural devices responding to a need to guard against solar penetration during hot periods of the year, though not necessarily in the winter months when the sun may be beneficial to occupants, both for light and heat. It is also worth noting the need to permit views to the square for psychological reasons. The arcades and high level shading devices will additionally provide some protection against the heavy rains that fall in the winter months. Having said that, the long axis of the square is oriented approximately east-north-east – west-south-west, which means that the south side of the square will only have the sun catch its façade late in the afternoons, when any form of vertical projection will prevent sunlight entering the building. Under these circumstances the projecting horizontal element at roof level will cast shade into the square, though that on the north side will benefit only the façade of that building. It appears that the designers have elected to create a symmetrical visual balance with the roof shades about the long axis of the square at the expense of a more rational environmentally-oriented solution which would be more in keeping with their stated aims. Perhaps this is the reason for the introduction, in this photograph of the model, of the kiosks and protective awnings. The first of the three sketches above illustrates a particular problem of this character of development – the long façade of the pedestrian arcade, apparently glazed, which has no modulation or articulation along it to create interest or attract passers-by. As is accurately shown, it will only reflect the square. One of the problems facing modern architectural interventions, not just in the Gulf, is in introducing something of the character and vitality the suq had in order to liven the area and benefit those having or choosing to walk along that route. The square can be seen to be relatively open, particularly in the third of the above illustrations. This open character should allow breezes to enter and give a degree of cleansing to its volume. It is notable that there appear to be no functional design elements such as wind towers or scoops to bring high level air movements down to ground level. This illustration, however, shows that the opportunity to create relatively narrow sikkak has been taken in areas off al-Barahat square, as well as a high level connection, presumably for pedestrian access. It is possible that sikkak such as this will help encourage the funnelling of air movements as well as assist in the production of beneficial environmental microclimates due to their narrow, tall proportions. In this there would be increased benefit, both climatically and psychologically, were there to be the addition of elements of soft landscaping. From the illustrations above it can be seen that both planting and water have been introduced into al-Barahat Square as design elements. Soft landscaping is an effective element of a design vocabulary introducing as it does, opportunities for colour, smell and movement to bring psychological comfort to those moving around the square or, if it is possible, to those looking out onto it from the buildings forming its perimeter. But the introduction of fountains may be problematic. Water is commonly introduced to hot countries in the belief that it will help bring comfort through increased humidity and interest from its noise and movement. These are particularly characteristics of fountains. However, Qatar enjoys not an arid but a maritime desert climate and, while not experiencing the discomforting humidity levels of other Gulf capitals, humidity can be uncomfortable on the edges of peninsula. If it is the noise of water that is required, there are better design examples than fountains. In urban design terms, large squares of the formal character of al-Barahat square are Western introductions; open squares such as this were not a traditional feature of the urban landscape of the peninsula. Where there were open areas they were usually associated with masaajid, where they form the useful function of containing overflow from the masjid as well as creating space for uses associated with its function. While the latter may no longer be a necessity, there is still benefit to be obtained from both urban design and cultural perspectives by defining these structures with an external space. Having said that, there appears to be only three masaajid visible in the first aerial illustration of the overall project. The model of the project set up for public view in Doha illustrates more realistic views of the scheme. This reflects the normal progress of architectural schemes. Regrettably, the model also illustrates more accurately issues such as the influence of road engineers in the treatment and detailing of roads and pavements within the scheme, as is shown in this photograph of a corner of the model. It is disappointing that the concern for detailing in the building has not been reflected in this area of the project. an urban room for the development, an urbanised version of the majlis, fostering communication, interaction and integration between different residential communities. there might usefully be located more seating, some it in formal arrangements suited to a majlis arrangement in order that these important socio-cultural functions might be encouraged to the benefit of these communities. But the creation of a space of this size, character and regular shape is also suited to its becoming a location for events, both formal and informal, as is suggested by the designers. At this stage in the development of the project it might not be possible to characterise and design for such events, nevertheless the fact that interactions are specifically wished for, it might make sense to consider them now and, if possible, illustrate them. Congregational spaces in Arab cities can be problematic. The floor of the square will be ‘carpeted’, clad in gold paving to recreate the richness and warmth of a traditional interior. It is not possible to determine the extent to which this feature will be effective or benefit those who will use the square, but it introduces another issue. Glare can be an issue in this part of the region. It is difficult to know how much of an issue glare might be with light reflected from the gold surfaces, but to some extent this will be vitiated by dust and sand. This is a major problem in the region and, in this natural feature, Doha is no different. It is not an insuperable problem and, given that there is a significant number of expatriate workers employed by Doha Municipality, a high quality pavement might work as a design feature. But if this is an important element of the design I would expect to see integrated systems for lighting and water for passers-by established at this stage of the design, together with seating elements as part of its vocabulary. A feature such as this may be damaged both physically and from a design point of view by unconsidered additions following the initial installation. In addition, consideration should be given to permanent markers incorporated into the design, signifying the direction of prayer. In 2011 work started on site. This photograph shows a part of the project where a traditional building has been reconstructed as a historical element in order to give a degree of context to the traditions of the past. Behind it is scaffolding for a part of the new development. This relationship epitomises a difficult subject which has been discussed in more detail on the pages dealing with Gulf architecture. There are a number of strands to the issue, but the most obvious relate to the honesty of reconstruction methods, the use or uses to which the reconstructed building will be put, and the incorporation of traditionally detailed buildings within a modern, novel context. This photograph, taken in the early part of 2012, shows lower levels of the construction, the reinforcing steelwork of the column bases visible together with poured concrete work in the top left corner of the photograph. While this is not by any means the whole of the project, it gives some indication of the scale of the work and, by extension, how the new project relates in scale and character to the buildings which previously sat on the site. This is an interesting scheme. It will be instructive to see how it develops into its built form, and how that form is taken up and used by those living and working in and around it. The 5th September 2010 witnessed the signing, by Al-Futtaim, Qatar Islamic Bank and Aqar Real Estate Investment, of a Qrs.6 billion joint venture agreement to construct a state-of-the-art leisure, hospitality, entertainment and retail complex in Qatar. On the 19th October 2011, the ground-breaking ceremony for this major new project, the Doha Festival City development, took place fifteen kilometres north of the centre of Doha on the Shamal Road. The 434,000 sq.m. project is seen as a regional centre comprising a hotel and conference centre, retail, leisure and entertainment elements including Ikea, Toys ‘R’ Us and Marks and Spencer together with automobile showrooms on around 260,000 sq.m. of gross leasable area, with provision for over 8,500 cars to be parked within a managed system. The 32,000 sq.m. Ikea store is scheduled for completion in 2012 with the rest of the project due to be completed by the end of 2014. To give an idea of its position, Umm Salal Muhammad is in the top left corner of this aerial map. In planning terms, this is a very large project and one which is significant in the strategic planning of Doha if not, as the developers intend, the region. What is notable is that they term the development a city, though it has no residential accommodation other than a hotel, or manufacturing activity, or any of the other elements which go towards constituting what this term is usually understood to mean. They go on to state on their website that the project is seen to have very good links not only with the centre of Doha – fifteen kilometres away, and the airport – twenty-two kilometres away, but also with Bahrein – when the causeway linking the two States is completed, reinforcing their view of the impact of the project. It is claimed that its position will be ideally equipped to meet the retail and entertainment needs of Qatar, as well as those of neighbouring GCC countries, by which I would assume they are referring both to Bahrein as well as Saudi Arabia which already has a causeway link to Bahrein as well as a land link through Salwa in the south-west of the peninsula. It is not clear if they are also anticipating attracting customers from the United Arab Emirates which is a significantly greater distance away. Qatar already has a large number of retail and entertainment outlets, many of them high-end facilities as is envisaged with this development. Not only that, but the surrounding States also have similar facilities, many of them targeted at the higher ends of their own different markets. It may be seen to be a little unfair, but these illustrations, albeit taken from a low-quality promotional video, show something of the intent of the developers, the difficulty being that they appear not to match the rhetoric which accompanies the video. Put another way, the images seem to illustrate the character of mall developments which can be found already in Qatar and the region, whereas it must be assumed that, for the hopes of the investors to be realised, it should be anticipated that the public spaces and attractions within or associated with the project should be extraordinary in their different respects in order to attract the numbers of visitors necessary for the project to be viable. The developers intend that Festival City should operate for much of the day, their aim being to encourage people to visit the various attractions there, staying for as long as the facilities can hold them over the day. This is likely to be the goal of many of the operators of similar malls in Qatar, these commercial operations naturally being in competition with each other. In their favour, staffing the facilities will not be a problem as expatriates will form virtually all this element. Access to the development will be relatively inexpensive due to the low cost of fuel, but the road and parking systems will have to operate easily in order to attract people from a distance. What is particularly interesting in the promotional video is the equating of the shopping experience with passive leisure – ‘keeping people entertained with a variety and diversity of international and local brands while enveloped in a lush environment…’ – an issue written about elsewhere, and a concept which is at the very heart of commercial developments in many parts of the world where designers strive to create experiences for visitors, in order to attract, detain and entertain and so encouraging them to part with their hard-earned money. It has to be assumed that the investors have carried out the necessary work to assure themselves that the project will be viable. In planning terms it is difficult to relate population to retail floor area as this has varied over time and incorporates a number of factors which are difficult to define and determine at a distance. Understanding of disposable income is certainly a necessity, but that is not the only function. Qatar has a very unusual economic profile; two of its characteristics are that it is extremely rich from its natural resources, and that it has a significant minority of its population native to the country. Associated with this is the fact that while Qataris benefit from the wealth of the State, the expatriates who make a living there generally will be attempting to save what they can in order to help themselves and their families on their return to their home countries. This implies that there are limited disposable funds by expatriates, particularly from the manual workforce available to spend in these large mall developments. A variety of factors attract visitors to developments such as this. Some of these are difficult to define and relate to issues which are accidental, indefinable or temporal. Doha Festival City appears from this initial exposure to be similar to many other developments in the region. Though larger, it is competing with them and its positioning some way from the centre of Doha may not work to its advantage while theoretically weakening the commercial developments planned for, and being carried out, within Doha, if not elsewhere in the peninsula. The issues of identity imposed by advertising and branding are looked at elsewhere, but although the development may prove a long-term attraction, like many of the other commercial projects, there may not be the population available to fill the large malls and provide returns to the investors. At the end of 2011 the press reported the completion of the first phase of the Barwa Commercial Avenue project. Announced as a joint venture between Hochtief and Barwa Real Estate Company in 2008, the project is due to open in March 2012 with completion scheduled by the end of the year. Barwa Commercial Avenue is stated as being the longest single strip development project in the world. The project is situated mainly on Muntazah Road in the Ain Khaled district, south-west of Doha, linking the industrial areas south of the capital with the existing southern extent of its urban fabric. Its position is illustrated in red on the adjacent aerial photograph where it is instructive to look at the scale of the project, as well as the state of adjacent developments at the time it was initiated. This is another large mixed-use project and is comprised of five buildings in its eight kilometre length. The type of building is similar in many respects to the traditional character of development commonly seen in Doha with commercial units established on the ground and mezzanine levels above which are two floors of office, residential and retail units. It is interesting to compare it with the Doha Festival City development, Barwa having around 200,000 sq.m. of retail area served by 5,560 car parking spaces. What is different from the Doha Festival City development is that Barwa will have residential accommodation, in this case, 462 single, two and three bedroom apartments. The project appears to be targeted at the upper end of the market, particularly noting its hope to attract young Qatari businessmen who will be able to engage in a ‘self-sustaining and business oriented lifestyle catering to entrepreneurs who expect contemporary elegant residences, efficient offices and convenient shopping options at their fingertips’. It is unusual to have such a long linear development deliberately planned in this manner, but there are advantages in the creation of an understood form of development which appears to have more convenient parking relationships than higher density developments. It might also be considered that the lineal form of the development will make it more flexible, compared with large, integrated developments. However, although the developer states that there will be shopping malls and spacious public spaces, there appears to be no internal circulation system providing relief from the harsher times of the year. On a rather different note the illustrations of the project are interesting in that they show something of the design intent. The first of these sketches show the corner of the development. At the south end of the project, the two façades face south-east and south-west but use the same form which appears to have little or no consideration of the environmental conditions which will obtain. It is also unusual in the way there is no articulation of the corner as might have been anticipated with stronger massing or drama to its design. Generally, the architecture has no relationship with the traditions of the peninsular, however the second sketch shows how it is intended to use a modern form of calligraphy on the façade of one of the buildings. This is an interesting use which should create a memorable advertisement for this part of the development while providing a degree of functionality. The calligraphy will help in screening the sun and should prove to be an important element of the building’s appearance at night. This project began construction on site in 2011 and is stated as being a governmental administrative building at Rumaillah. Situated on relatively high ground north-east of Rumaillah fort, the building has been designed in a style which has upset a number of contributors to one of the forums in Qatar where those with an interest in the physical development of the peninsula post their comments. While some admire the style which they see as traditional, there seems to be a groundswell of complaint about there being yet another building designed to imitate a castle or fort. 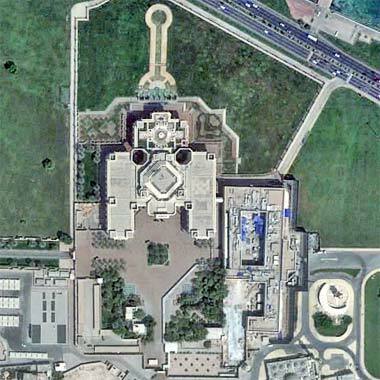 One of the correspondents has pointed out that the al-Shamal Club, al-Gharafa mall, the Capital Police Headquarters and the al-Wakra hospital have all been designed in the shape of a ‘castle’, another noting that there appears to be a dichotomy in design focus between different Qatari organisations dealing with development – the Private Engineering Office and Qatar Foundation being the two quoted. The design certainly replicates a fortified structure, regrettably one with no connection with the peninsula, but the comments are interesting in that many would like to see no more of this type of architecture, preferring to have something ‘modern’. The site plan shown here is one guessed at from having looked at the work in progress on Google Earth. The project has been placed here as it illustrates a rather different approach to the design of office buildings from those shown elsewhere, particularly those designed by expatriate architects. The contract cost of the project was announced in 2010 as Qrs.1.6 billion. Mention has been made above of the number of buildings perceived to have been designed to resemble the traditional architecture of forts in the peninsula – and the criticism made of this type of modern design. Here is a night photograph of one of them – the structure which surrounds the stadium of the al-Shamal Sports Club outside al-Ruwais in the north of the peninsula, complete with the floodlighting arrays on its corners necessary to light the pitch and players. The walls of the design are set on grassed berms set at 45° which serve to elevate the walls higher than would have been traditional practice, giving them better scale and permitting access to the stadium without breaking the integrity of the walls. In fact the walls with their associated towers have only the mushrafaat on the corner towers to imply scale. The unrelieved top of the joining walls is unfortunate in this respect and there are no other clues to give scale to those looking at the building. Viewed by day the structure certainly appears to replicate a fort with no good reason but, by night there is a logic that becomes more apparent. In plan form the stadium’s surrounding wall replicates the four-sided plan of the traditional forts with circular towers buttressing three of the corners and a rectangular structure in the fourth. In the stadium design, the three circular corners support lighting structures, as does the rectangular corner where ancillary accommodation is located. If there is an illogicality it is, perhaps, that there are not four circular corners supporting the lighting system. Along the outside of the wall there are lights creating spots of illumination rather than washing the walls evenly. While this serves to break down the scale of the wall and make the structure appear less impersonal, the lighting of the corner towers seems a mistake and should have strengthened these elements of the design. It should be borne in mind how important lighting is to night sports. There is now considerable investment associated with football. With it comes an imperative to provide high quality lighting systems in order to provide both an accurate live viewing experience but, more important, the capability of responding to the needs of high quality television cameras and the transmittal of images that will benefit fans, advertisers and sponsors. For this reason, the form chosen has a compelling rationale to it. Whether or not the selection of such an important traditional architectural form should fulfil this modern rôle is another matter. The winner of a limited international design competition for a mixed use development in Doha’s New District of Doha, the Alpha project is, at first glance, visually unsettling in that it is a dramatic departure from the various and different styles of architecture that have already been brought to the peninsula from abroad. This illustration shows its appearance fronting onto the State Plaza with the triangular form of the Sheraton hotel over the West Bay on the skyline. The project has a very important location, being sited at the east end of the road, Khalifa Street, which leads down the hill from the television studios roundabout to the continuation of the ‘A’ ring road, Majlis al-Taawon street, which acts as one of the main distributors into the New District of Doha. As can be seen in this location plan, the site of the Alpha project is interposed between the ‘A’ ring road and the Corniche – the ceremonial link with the New District of Doha – on the bay side of which is the State Plaza. Separated by a feeder road, on the north side of the site is the General Post Office building and, to the south of the site and contiguous with it, is the development originally designed and constructed as the Ministry of Information, now the Qatar Museums Authority. In a sense the Alpha project can be seen as being located at the entrance to the New District of Doha, separating Doha of the nineteen seventies with its subsequent expansion north. The importance of the project lies in its attempt to combine a number of initiatives and design principles into a coherent response to, specifically, the environmental impositions of the maritime desert climate presented at this point of the peninsula. In doing so the scheme intends to be a sustainable development utilising passive design principles allied with energy derived from the wind and sun to create an environmentally discrete system similar, in a sense, to the much larger Masdar development of the United Arab Emirates. The first of these three sketches illustrates the intended principles of utilising solar panels and wind turbines mounted on the buildings with collection, treatment, storage and distribution systems for rainwater and grey water, together with on-site desalination from the shallow body of water provided by the West Bay. The second sketch illustrates other environmental principles to be utilised by the building. Shading of the building, when necessary, will be provided by screening on the façade while, on the ground pergolas and planting will create a shaded environment for those using the areas around the buildings. Water fountains and streams are intended to be used to create a fresh atmosphere while the buildings themselves will act as natural ventilating systems, this being supplemented at ground level by smaller wind towers to create air movement and ventilation. This third sketch is of the façade of the building which design appears to be based on two principles. The first is functional, incorporating into the façade of the building solar panels together with shading devices. The second principle is an applied geometrical approach and is based on girih tiles, a character of patterning recently identified with some Islamic design work. This geometry is to be applied at both a large and detailed scale of sub-divisioning both on the façade as well as in elements of shading at lower levels. It appears that this is not structural and is likely to be self-supporting. This sketch illustrates how the geometric treatment of the façade is moved into the lower horizontal planes in and around the buildings with the intention of creating a unity of design for those moving around the project. This is, perhaps, one of the more notional illustrations for the project, but given that the intention is to create a universal architectural vocabulary, this might well be conceptually true, though will require considerable change in reality. It is intended that the geometric design vocabulary evolves into the areas surrounding the buildings where it will provide a background both to the shading and divisioning or partitioning systems, but also three-dimensional frames within which soft landscaping and water elements will be located together with wind towers or scoops providing ventilation and cooling systems in and around the development. The design principles set out at the head of this note are sound and relevant to the need to reduce the impact of buildings on depleting resources. But this scheme is, in large measure, conceptual as are many competition entries; it will take time to see how the various principles are incorporated within realistic design elements, and how efficacious those elements are likely to be. Because of this it is not possible at this stage to make a detailed critique of some aspects of the project, though there are one or two elements worth mentioning. While the development is partly based on traditional environmental systems, there appears to be a misunderstanding of at least one element of control, that of using water to increase humidity. Qatar has a relatively humid climate and, with the site being located beside the sea, it is not a good idea to try to increase humidity. There may also be an issue with wind as there is a significant diurnal pattern to littoral developments and there will need to be considerable research into wind direction and strength patterns in order to incorporate effective turbine systems both within the building as well as at grade surrounding the development. In a sense, the preceding comments relate to details that would be a part of the natural development of the project from sketch to detailed design. What has to be borne in mind is that much traditional design and constructional knowledge has been lost with industrialisation. With the increasing trend to use natural resources there is a significant amount of investigation to be accomplished if these elements of design are to be rediscovered, proved effective and contribute significantly to the stated objectives of the project. In this process, much of the original design may need to be amended. With regard to the urban design aspects of the project there are three areas of additional comment to make. The first relates to the location of the project. The position of the development is, as stated earlier, significant strategically as not only does it mark the entrance to the New District of Doha for those moving along the Corniche and ‘A’ ring road, but it is also at the entrance to Doha in its location around the West Bay by those coming from Medinat Khalifa. With the Qatar Museum Authority on the north side of this visual axis the buildings create a heavy emphasis to the south of it with, as this illustration shows, the shaded side prominent. The development is around 100,000 sq.m. and needs to have a relatively tall component in order to achieve its permitted density. Having said that, it can be seen from these typical floor diagrams that there is a significant amount of unusable space in the plan form that has been developed. The designers have opted for three towers with interconnections at a high level, links which will provide a significant element at this important location. As a way-finding symbol it occupies a crucial position. While its height has been kept similar to many other buildings in the New District of Doha, the form it takes is heavy due to the facetted form it takes. The crystalline structure selected creates an irregular mass unlike, for instance, the Burj building which has a strongly geometrically defined façade, but applied to a regular form. As a consequence, this latter building has a light appearance compared with the Alpha project although, with the light shining on it as in this photograph, it will appear lighter, even if its form is heavy. At ground level the articulation of the buildings is replicated in the treatment of the containing forms that will define areas and lead people around the project. I have written elsewhere about concern for the amount of development and the ability for it to sustain social structures. This is a mixed use development but it will compete with all the other developments for users, both those having business within the structures as well as those visiting to enjoy its ambiance. Few people walk in Qatar, so there will need to be extensive parking as well as land uses that will attract and entertain those who have chosen to visit. There are many elements of this project to commend. But there seems to me to be no connection with anything in the traditional vocabulary of the peninsula that would relate this modern development to the past. Of course there will be some who will feel that to be an unnecessary design parameter, however, every modern intervention can separate a national population further from their heritage. The use of girih geometry plays little part in maintaining a connection. Though I am not against its use I would much prefer to see a more regular geometric solution on what is otherwise an intriguing project. It will be interesting to see how the environmental initiatives develop to create a workable built scheme. At the beginning of 2011, the Qatar Museums Authority announced its intention to develop a new Qatar National Museum at feriq al-Salata. The design will be associated with the existing Qatar National Museum which was once the residence of Sheikh Abdullah bin Jassim bin Muhammad al-Thani. In this aerial photograph of the conceptual model, the old residence is the orthogonal building complex aligned almost on the axis to Mecca, this photograph looking approximately south-east. The Corniche and the waters of the east bay of Doha are on the left of the photograph. The project is sculpted in the vocabulary of the delicate crystalline desert rose formations that are found in the desert, its curvilinear forms in strong contrast to both the old, restored buildings of Sheikh Abdullah bin Jassim as well as the modern additions of the early nineteen-seventies. In this photograph, looking from the east bay, the old two-storey building can be seen just right of centre. This photograph is essentially a closer photograph than that above and illustrates, from the same axis, the main entrance to the project, apparently viewed from the Corniche. …that supported the flow of commerce, information and people across desert trade routes – and so gives concrete expression to the identity of a nation in movement. Its strategic importance is that the contents of the building are intended to present Qatar’s culture both in its physical and immaterial forms. It is from this standpoint that the references to a caravanserai seem most relevant; the building will be experienced in a different way from the other museums in Qatar in that visitors should come away with a stronger understanding of the peninsula and the socio-cultural history of its people than when they entered, this understanding having been formed by a stronger volumetric immersion than is obtained in the more traditional focus on objects that is the chief characteristic of most museums. In this regard it seems to be an apposite treatment for the building to be seen as introverted in its plan relationship with the residential development of Sheikh Abdullah. Moreover the selection of the crystallised sand forms derived from the desert rose also seem relevant both notionally as well as structurally in their intrinsic ability to contain a variety of non-orthogonal volumes within references to a naturally occurring material of the peninsula. It is also worth noting that the contrast of the shapes of the building should provide a dramatic counterfoil to the old buildings, though it is not yet known what material and finish they will have. The model shows no soft landscaping. Whether this is deliberate or not is not possible to know at this stage of the project’s development. While soft landscaping is usually a requirement of clients, the model appears to hold its own with only hard surfaces illustrated. If this is true for the exterior of the building, a distinction might be considered, similar to a caravanserai, where the internal courtyard would be the area where water and plants are located to enhance the experience for travellers resting there. While much of the intent must, for now, be taken on trust, there is no reason to think that the new museum will be nothing other than a success in its rationale, guided in large measure by the quality of this architecture. It will be interesting to see how this sketch model will develop as it is detailed with regard to the variety of functions it has to provide. In Autumn 2011, the winning scheme of a competition for a proposed College of Engineering was announced. Its purpose is to expand the capacity of Qatar University with seven faculties comprising those of architecture, chemical, civil, computer, electrical, industrial and mechanical engineering. The project comprises around 60,000 sq.m. on a slightly smaller site and is designed to create a microclimate within it suited to its environmental setting. 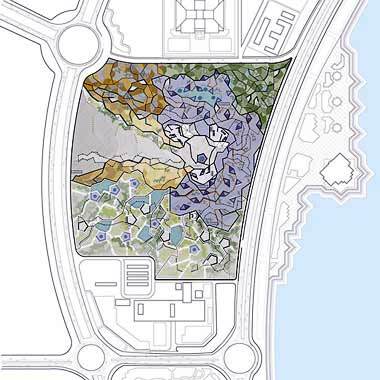 The rationale for laying out the two axes upon which the buildings are aligned has been given as having regard for views to two areas: Qatar University with its focus toward the development around the Pearl and al-Safliya island, and south-east to the tall buildings at the north end of the Corniche. The main spine follows the latter line, the three wings aligned east-west – the Pearl/Safliya line. In this way the three wings are best oriented with regard to solar gain. Nevertheless, the spine of the development is aligned on the same axis as Qatar University, immediately to its south-east. The three wings of the building are further shielded from solar gain by the use of ramps which lead the landscaping onto the building, providing a degree of insulation as well as shielding the south-facing glazed façades which, additionally, are screened. This method of taking landscaping over the building not only helps to protect the building from solar gain but also enables winds to move over the building while softening the visual impact of the building in its landscape. However, bearing in mind that the shamal comes from the north-north-west, having the ramps flowing from the south-east will not benefit the development in this way. This view of the project looks at the building between two of the wings, looking west. The windows on the left are facing north and will provide significant illumination to those spaces behind them. The roof directly ahead, seen also in the section above, will provide a degree of lighting to the circulation spaces below it. 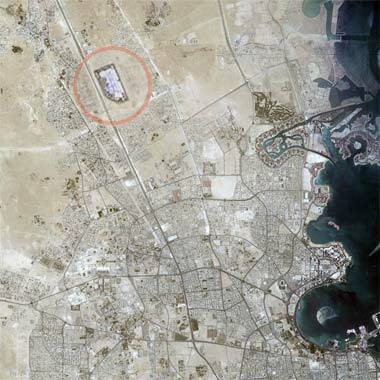 There is no indication of any natural ventilation system though the aerial perspective, shown above, may represent an element in such a system, though is stated as representing a visual reference to the existing Qatar University buildings to its south. The minimal landscaping shown here is assumed to be notional and yet to be developed. The previous comment is also likely to apply to this illustration of the interior view of one of the wings, apparently taken looking towards the main spine and with a notional landscaping treatment introduced. The sketch suggests that the space is intended to be one in which people can both relax as well as attend formal or informal events. Note that the wings are organised with offices on their south sides, lecture halls and the like on their north sides. This is another scheme which states its intendtion to take significant advantage of environmental considerations in order to benefit those using the building. Yet its urban design is not as well integrated into its surroundings as it might be, particularly with regard to the north side of the building, as well as with regard to its relationships with the surrounding roads – though this is a general problem and not specific to this design.